At Clocktower on Lygon Carlton our serviced apartments are large and spacious allowing you to relax and unwind without being cramped or claustrophobic - abundant space for family, friends and colleagues. Entertaining your friends, family and colleagues with a home cooked meal using our fully equipped kitchen is just like at home. Carlton Clocktower Apartments offers two bedroom apartments - an ideal alternative to a traditional hotel room, where guests can stay in a self contained apartment that is equipped with a full kitchen and full cooking facilities, private laundry and a spacious living room. Enjoy the many and varied delights that Lygon Street has to offer without worrying about driving home. The Clocktower Carlton serviced apartments are localed amongst over 300 restaurants quite literally on your doorstep in Lygon Street, making this a great accommodation location for food lovers; for those who love coffee and Melbourne's cafe culture; for those who love el fresco dining, and for those who love sharing meals and a glass of wine with friends, family and colleagues in great vibrant surroundings. Parents visiting their children who are in Melbourne to study at the local universities will find the extra living space needed in the Carlton Clocktower Apartments and also be conveniently located only 2 city blocks from The University of Melbourne and only 5 city blocks from RMIT. They will be able to utilise the fully equipped kitchen to provide a taste of home whilst the family and friends relax in the spacious surrounds of the apartment. Friends travelling together will enjoy the privacy of seperate bedrooms, and also the convenience and time saving nature of having their own laundry with washer and dryer. You will be able to relax and enjoy good food and be spoilt with choice with over 300 restaurants and cafes to choose from just on Lygon Street. 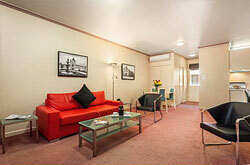 Less than 2 kilometres from Melbourne's CBD, Carlton Clocktower Apartments is also located only 500m from The Royal Exhibition Buildings, The Melbourne Museum, IMAX Cinema, Brunetti's, La Mama, The Nova Cinema, and a major supermarket where you can pick up all of those things that you may need to make your stay with us even more enjoyable. 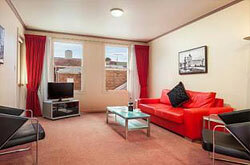 Also, the Melbourne Zoo is only less than 3km from our Carlton Serviced Apartments. Companies Travel Budgets Can Stretch Further by Staying at The Carlton Clocktower Apartments, As Self Catering Is Cheaper Than Restaurant Meals and Hotel Buffets. Ideally centrally located for the business traveller, Carlton Clocktower Apartments is situated in the heart of Carlton, just a short 2 km tram ride from the Melbourne CBD. 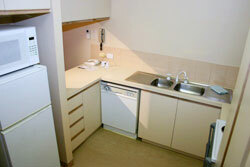 Business guests may also choose to use our apartments for meetings, interviews, discussions, presentations etc. Our apartments offer Wireless Broadband through a third party provider, for those in need to keep in touch with the office and home. There's also laundry facilities in the apartments or a dry cleaning service, secretarial service, breakfast packs and pantry shopping services available upon request. 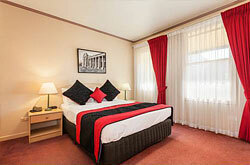 The Apartment Accommodates up to Four Guests with 1 Queen size bed and 1 Double bed.